Background: Unmanipulated T-cell replete haploidentical allogeneic stem cell transplantation has become an attractive alternative choice for patients with no HLA matched sibling or unrelated donors. However data of outcome in patients with Acute Lymphoblastic Leukemia (ALL) is still scarce. The Acute Leukemia Working Party (ALWP) of the European Society for Blood and Marrow Transplantation (EBMT) conducted this study to compare the outcome of allogeneic transplantation (Allo-SCT) from haploidentical donor (Haplo) versus matched (MUD 10/10) or mismatched (MMUD 9/10) unrelated donor for patients with ALL in first complete remission (CR1). Methods: The outcomes of 1,234 adult patients with Philadelphia positive or negative (Ph+ / Ph-) B ALL or T ALL in CR1 who underwent Allo-SCT between 2007 and 2016 were analyzed. Comparison was made between Haplo (136 patients), MUD 10/10 (809 patients) and MMUD 9/10 (289 patients). Multivariate analyses were performed using the Cox proportional-hazard model. To control potential confounding factors between treatments that could influence outcome, propensity score matching was also performed between Haplo and the two other groups. Results: Recipients of Haplo, MUD 10/10 and MMUD 9/10 were comparable concerning median age, time from diagnosis to Allo-SCT and myeloablative versus reduced intensity conditioning (MAC/RIC). However, Haplo transplants cohort had higher percentage of female donors and female to male mismatch accordingly, higher marrow (BM) versus peripheral blood (PB) as the source of stem cells and lower CMV matched negative status. As expected, most Haplo patients received post-transplant cyclophosphamide for graft versus host disease (GVHD) prophylaxis (77%) while this regimen was rarely used in the other groups (about 3%, p=0.0005). Univariate analysis showed similar outcomes in Haplo, MUD and MMUD. Disease free survival (DFS) was 49±11%, 53±4% and 55±7% (p=0.67), and overall survival at 3 years (OS) was 54±11%, 62±4% and 62±6% (p=0.11), respectively (Fig 1). Relapse incidence (RI) and non-relapse mortality (NRM) at 3 years, acute GVHD (AGVHD) at 100 days and chronic GVHD (CGVHD) did not differ either. After adjustment for center effect, patient age, donor/patient gender, donor and patient CMV serostatus, ALL type (B Ph- vs B Ph+ vs T), time from diagnosis to SCT, type of conditioning and cell source (PB vs BM), the multivariate Cox model showed that Haplo recipients did not experience worse outcomes compared to MUD 10/10 and MMUD 9/10. Indeed, compared to Haplo, the Hazard Ratio (HR) for DFS was 1.1 for MUD (p=0.7) and 1.1 for MMUD (p=0.8), the HR for OS was 0.9 for MUD (p=0.4) and 1.0 for MMUD (p=0.1). The HR for RI, NRM, AGVHD II-IV and CGVHD were not lower either. Propensity matching confirmed the results of the multivariate Cox analysis with no difference in outcome between Haplo, MUD and MMUD. 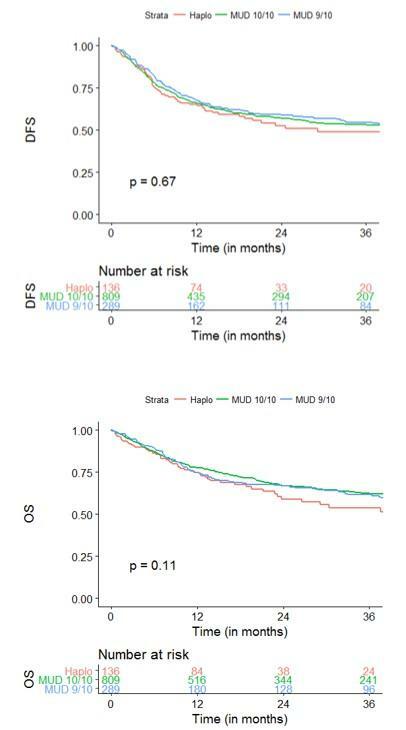 Compared to Haplo the HR for DFS and OS were 1.04 (p=0.84) and 0.85 (p=0.50) for MUD and 0.9 (p=0.66) and 0.82 (p=0.48) for MMUD. Conclusions: Outcomes of adult patients with ALL in CR1 receiving Haplo Allo-SCT are comparable to MUD or MMUD transplants. Haplo should be considered as an additional option for patients lacking a matched sibling donor.